I am Ical, Dhyta Caturani’s friend and colleague. She needs all of your concern and support. Dhyta Caturani is an activist, a feminist, a friend, a comrade in arms for all of us. We acknowledge her as a brave, smart, and reliable friend. 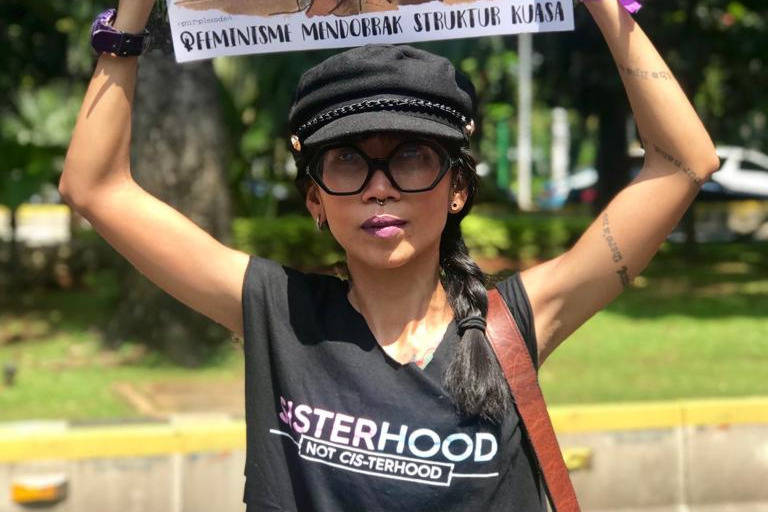 Dhyta is a straightforward and consistent in her activism and attitude, and she has dedicated herself to social issues: she never gives up the fight for gender equality, digital security, freedom of expression, labor, eviction, mining that harms farmers, etc. Standing around her, we feel her powerful life force. Talking to her, we get her knowledge and experiences. Walking with her, we step with her conviction and courage. More than half of her life has been devoted to the rights and interests of marginalized communities. Dhyta and her courage to resist injustice has never waned – and never will. However, these past two months, she has been struggling with another problem that she needs to face with the same spirit of resistance. She has been fighting her sickness which has been eating away her tiny but agile body. She has undergone treatment procedures, and will continue to do so. Yes, Dhyta is fighting her pain as vigorously as she fights injustice. Dhyta has kidney cancer (chromophobe renal cell carcinoma) and she had just undergone a surgery that removed her right kidney on March 19th. Don’t be shocked and sad. All of us want Dhyta to recover and to fight -- not only with courage and anger but also with happiness. Therefore, we ask all of you, whether you know her personally or not, to support her in her recovery journey. Dhyta’s treatment procedure, starting from pre-surgery up to post-surgery, will require a lot of financial resources. The cost of Dhyta´s medical treatment is estimated to be Rp 400.000.000 for the surgery and the treatments afterwards (roughly US$ 28,000). We, as her friends, have been fundraising for her locally, and we have managed to raise Rp 200.000.000 for the surgery – half of the estimated cost. We still need Rp 200.000.000 (roughly US$ 14,000) more to support her recovery and post-surgery treatments. Let’s give our support for Dhyta by helping her with her medical costs. Your support can be on behalf of solidarity, collectivity, concern for a friend, or affection for Dhyta. Aside from donating, you can also help Dhyta by spreading this message to your close friends so that more people can provide support. If the funds collected from the fundraising exceed the targets for the treatment and care process, Dhyta will donate back to a “Safe Space” for women who are victim of violence in Indonesia. Thank you for the good deed, support, and help. May all of you are always healthy and full of courage! Shout for solidarity!